Beers Made By Walking: Full list of beers for October 8th! Full list of beers for October 8th! 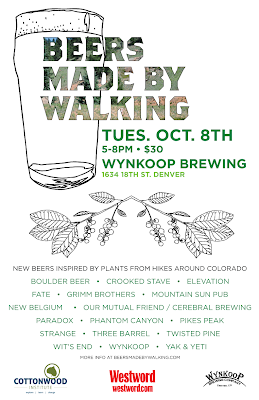 Beers Made By Walking is right around the corner, this Tuesday, October 8th at Wynkoop Brewing. As Denver begins to transform itself into a mega palace for craft beer, we thought we'd draw your attention to the landscape itself, with seventeen beers that gained their inspiration from hiking trails around the state. We're wrapping up some of our final details and we realized that we have information for nearly all of the beers that will be a part of our event. So, without further ado, have a look at this impressive beer list! If you want to make sure you get to try these beers, you will want to buy your tickets in advance. Boulder Beer / Spirit Guide / Stout brewed with Chokecherry, Dandelion, Milk Thistle, and Echinacea. 7% ABV. Elevation / Last Run / A bright, citrusy, hoppy blonde ale brewed with a hand-made extract composed of wild red currants. 5% ABV. Fate / WILD Flower Honey Wheat / Classic American Wheat brewed with honey, Summit hops, and Brettanomyces. Grimm Brothers / Kinder Beer / Bohemian-Style Pilsner blended with wild raspberries picked while hiking near near Mt Bierdstadt. Mountain Sun Pub / Achilles Field / A Saison that highlights the earthy flavors and aromas of Yarrow, which grows all over Denver. 5.6% ABV. Our Mutual Friend and Cerebral / Urban Flora / Saison brewed with fresh Denver dandelion greens and hand-toasted sunflower seeds. 6.9% BV. Paradox / Wild Chokecherry Sour / Created using a Sour Mash technique, the tartness of the wild chokecherries is balanced with locally sourced honey and wild hops. 7.5% ABV. Phantom Canyon / Electric Eye / A 50/50 blend of two Saisons, aged for one year. One Saison is our previous BMBW offering brewed with three-leaf sumac and rose hips. The other, contains hibiscus flowers, galangal, lemon and orange zest. Pikes Peak / Currantly in Colorado / Imperial Brown Porter brewed with Golden Currants, based on a hike near the Palmer Lake Reservoir. 6.5% ABV. Strange / Noah's D'Ark / A Belgian Dark brewed with wild hops and prickly pear cactus fruit harvested along Clear Creek and Bear Creek, after the floods. 6.5% ABV. Twisted Pine / Flatirons Vista Wit / A light, crisp Witbier brewed with White Nectarines, inspired by fruit discovered on the Flatirons Vista Trail in Boulder. Wit’s End / Killer Rabbit / A blonde Belgian ale made with Rabbit Brush form the South Platte River trail in Denver, with local Rabbit Brush Honey. 6.5% ABV. Wynkoop / Blau Bär / A lager infused with raspberries, thyme and blue gummy bears. Inspired by the large blue bear in front of the convention center in Denver. 4.2% ABV. Yak & Yeti / Needles! / Colonial-style spruce beer, with Colorado blue-spruce tips, aged on cedar. The beer was inspired by a hike near Buffalo Bill's Grave in Golden, CO. 7.9% ABV.